Whether you’re an up-and-coming young professional or a seasoned manager, email is a vital aspect of business communication. And thanks to what’s often seen as the mysteries of English grammar and the subtleties of the written word, it can be a daily struggle. That’s especially true if you have to motivate busy people to respond or address a potentially touchy subject. To write a great email, you need to know two things: common mistakes to avoid, and next-level strategies to get ahead. But first things first—you have to know what a great email looks like if you’re going to write one. The subject line could be the most important part of the email, though it’s oftentimes overlooked in favor of the email body. But if you’re cold-emailing someone, or just establishing a professional relationship, your subject line can entice people to open the message as well as set expectations about what’s enclosed. On the other hand, a poorly crafted or generic subject line (like “Hi” or “You don’t wAnt to miss thos”) can deter the reader and result in your email landing in the spam folder. 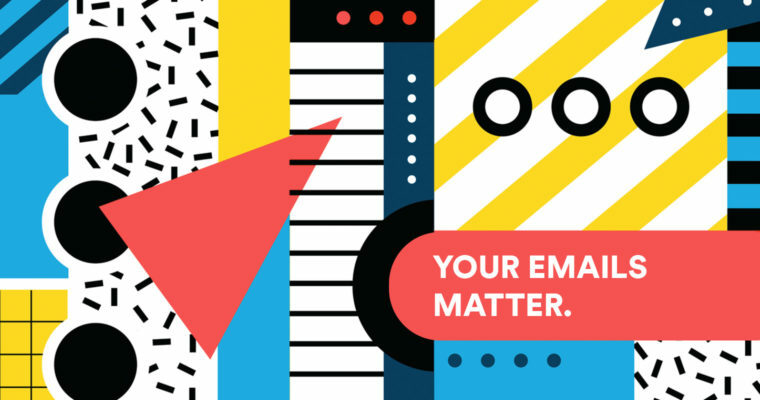 “Spend double the amount of time crafting the right subject line as you do on the [body] because if they don’t open the email, it doesn’t matter,” says Cole Schafer, founder and copy chief of Honey Copy. In most emails, you’ll want to include a quick greeting to acknowledge the reader before diving into your main message or request. The exception: When you’re on an email chain with close colleagues, it often becomes more natural to drop the opener (as well as the closing). Though it may initially feel like a faux pas, it signals a better professional rapport. The body of an email is the meat of your message, and it must have a clear and specific purpose, such as getting feedback on a presentation or arranging a meeting with a new client. It should also be concise. That way, people will be more inclined to read it, rather than skimming it and risking missing critical information. If you can, boil it down to a few choice sentences. And for emails that require more length and detail, keep it as focused as you can. “Nobody wants to receive a novel. You want to keep it between three, four, or five lines of text,” says Schafer. Just as you want to start things off on the right foot with your greeting, you also want to part well. That means writing a friendly sign-off. And there are plenty of options to choose from. You’ll want to choose a closing that feels genuine to your personality and tailor it to the relationship to ensure an appropriate level of professionalism. On the other hand, common closings like “love,” “sent from iphone,” or “thx,” may be best left unused in professional emails. You can add any word to your Personal Dictionary. Which words will you add? The Oxford comma can be somewhat polarizing, depending on which style guide is utilized for professional communications in your industry —it’s usually either shunned or hailed as a tool for clarification. Either way, a lot of people have strong opinions about it. But leaving them out can lead to confusion, depending on the sentence. Just like a healthy marriage, AP style calls for clear communication. We also believe in the value of compromise. So as a reminder, the Stylebook doesn’t prohibit all Oxford commas. If omitting a comma could lead to confusion or misinterpretation, then use the comma. What to do instead: While the Oxford comma may not be suitable in certain contexts, it’s usually a good idea to use them in emails. That’s because it can help you save time and avoid miscommunication, confusion, and even . Bloggr users know that when it comes to hedging, it’s better to omit it than leave it in, especially in emails. And if you’re worried about coming off as impolite, don’t be: Contrary to popular belief, hedging language makes you sound less confident, which can ultimately undermine your writing. What to do instead: State your idea or opinion, then explain the “why” behind your reasoning. That way, you’ll be better understood and your brilliance can shine through. “I get a ton of [emails] that are just these huge blocks of text. And I understand why they do that—so you have enough detail. But it’s really hard to read and I’m not going to read the whole thing,” says Kat Boogaard, a Wisconsin-based freelance writer. What to do instead: Keep it concise and focus on the matter at hand. Then end with a call to action, a requested response date, and make it clear that you’re open to questions and follow-ups (if that’s the case). Depending on your circumstances, wavering too much to the casual or formal side of writing can be a misstep. Being overly casual is often seen as a rookie mistake, but stiff, formal language can also be detrimental to your message. What to do instead: In striking the perfect balance between formal and casual, the key is thinking about the relationship between yourself and the recipient and take social cues as your communication progresses. “You kind of want to see what someone else is doing and participate, play along, sort of acknowledge the way communication develops and the way expectations in a relationship develop,” says Dan Post Senning, an at the Emily Post Institute. Here’s a tip: While GIFs and emojis can be great for creating a sense of comradery between coworkers, these can be seen as overly casual in many contexts. “Be careful in new relationships. The intelligent use of emoticons in emails can help you be more understood. At the same time, a lot of people will read it as unprofessional, so until you’ve established that relationship, you want to be careful with how you use it. Take care and think about it,” says Post Senning. Not all email cliches are cardinal sins. Certain aspects of your emails are bound to be a little formulaic. After all, most emails have the same basic structure, and there are phrases that you may use to ensure clarity or cover your bases. But if you’re going to repeat phrases, make sure they have a clear purpose. Method: We searched for terms used by Bloggr users based on our most popular blog articles. What to do instead: Try reading the draft for cliches, tone, and voice to more effectively communicate your message while keeping the reader engaged. Ask yourself: If your boss (or mom) read this email, would you be happy with it? If the answer is yes, then you’re on the right track. People often repeat words within the same paragraph, twice in two sentences, or just too close together to go unnoticed. While it’s not the worst offense, it’s another thing that can make a reader tune out. What to do instead: Try reading your draft out loud, using the text-to-speech function on your phone, or running it by a colleague before sending it off. Bloggr can also help you catch these repeated or overused words. Email may be a descendant of snail mail, but that doesn’t mean your messages should sound like an old-timey version of yourself. In fact, emails should sound like the person who is writing it. So using phrases that sound like something out of a Victorian novel isn’t the best move if you want to connect with the reader. “Let’s face it: Nobody wants to read a college textbook. You want to read a blog or an article or a real conversation. They’re a person, they’re not a robot. So use language that sounds like something you would say if you’re just sitting in a coffee shop,” says copy chief Schafer. 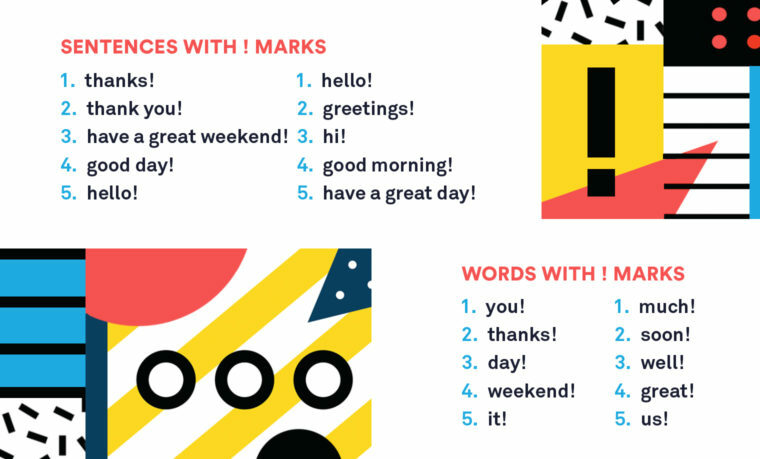 8 Overuse of exclamation points! Enthusiasm is great. But in certain contexts, the overuse of exclamation points can do more harm than good. This is especially true if you’re forging a new relationship or ing someone outside of your company. You are, after all, a representative of your work when you use a company email address. But people love exclamation points, and they’re still something that many people rely on to convey a positive tone. What to do instead: After you’ve written your draft, do a quick search for exclamation points and use your judgment to determine which (if any) to keep based on your relationship with the recipient. As a general rule, try to keep it to one or two per email with colleagues. Grateful that a content superstar like uses Bloggr. Sending an email that is remotely negative, or even neutral, can put you in a tricky place. And as with any written communication, there may be room for misinterpretation. You wouldn’t want to get an email that reads, “Dear [client],” or which references your work in public relations when you’re actually in sales, because it would immediately show that the sender is either mass emailing you, or they didn’t do the proper research and find the right . Similarly, you’ll want to make sure that every email you send is crafted specifically for the recipient, and that you’re sending it to the right person. So even though it may be tempting to use templates, it’s important to personalize it and keep in mind the communication style of the recipient before hitting send. To accomplish this, a quick Google search or a peek at the recipient’s LinkedIn or Twitter feed can do wonders. Before sending, try putting yourself in the recipient’s shoes for a gut-check on tone and content. If you’re sending an email, you’re likely looking for a timely response. But with the large amounts of emails most people sort through each day, things can end up getting lost. As a general rule, a follow-up message should never come less than twenty-four hours after sending the initial email. In other words: Don’t be the person who sends a follow-up request two hours after sending. In extreme cases, that kind of behavior can even get you blocked. “When you’re taking more time and actually caring about the person on the other side of the email, you’re immediately going to see a much higher response rate. I had to learn that the hard way,” says copy chief Schafer. Most of the messages you send will likely be on the shorter side, which is great for rapid responses and getting things done. But for longer emails, scannability is the name of the game. That’s when things like bolded font, bullet points, underlined sentences, and a TL;DR (too long, didn’t read) section come in handy. There are a lot of factors to keep in mind when composing an email, and there’s a wide margin of error. But after all is said and done, it isn’t about perfection. It’s about effective communication. “I think people feel this pressure that you need to be this perfect communicator with this huge vocabulary and these perfectly structured sentences. And I don’t know that that’s always the case because you’re just two people, communicating,” says freelance writer Boogaard.